Philips expands range of Fidelio docking systems with £250 model | What Hi-Fi? Like its bigger brother, it can play and charge an Apple iPad, iPhone or iPod. It's Bluetooth enabled for wireless streaming, has a pair of 3in full-range speakers, built-in 30W amplifier and a similar curved-cabinet design "to minimise sound diffraction". 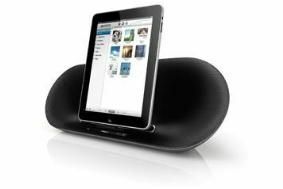 The DS8550 also uses Philips's PureDigital sound processing technology to take a direct digital input from the attached device, so the digital-to-analogue conversion is handled by the dock itself to improve sound quality. A built-in rechargeable battery gives a claimed playback time of up to five hours, and a proximity sensor means the controls light up when you approach the dock. Philips has also developed a free Fidelio iTunes app which allows easy browsing and playback of your music, control of the five-band equaliser and a quick check of your Fidelio dock's battery life from your Apple device.